Málaga: the place with the most beautiful beaches, the birthplace of Picasso and the most historic and culturally rich provincial capital of whole Andalucia. Málaga has long lived in the shadow of the most famous cities like Granada, Córdoba and Seville. Yet it emerged as one of the most facinating cities where you will be surprised day by day. It is a pleasure to walk through the recently restored historic centre of Málaga. The cathedral of Málaga is surrounded by narrow streets where you can find many bars, restaurants and shops that show the authentic city. Climb the Gibralfaro and see the skyline that reflects the cities varied character. It is a destination where you want to return to, over and over again. 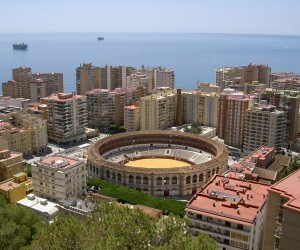 To help you get around during your stay in the city we created a “Top 12 places worth visiting in Malaga” list. These places will help you getting around like a real malagueño! Mercado Central de Atarazanas is the most famous indoor central markt in the historic centre of Málaga open every morning. 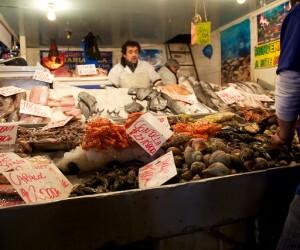 The malagueños buy here fish, meat, fruits, vegetables, and a lot more. El Mercado Central de Atarazana is a place where you can observe the authentic culture. Noises, yelling, talking, gossips and laughter are the things that you will here around you. A great experience, that you should not miss. 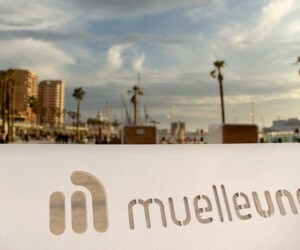 Muello Uno is located very close to the harbor of Málaga and offers one of the most beautiful views over the historic centre of Málaga. It is an ideal place for some shopping, have an ice cream and to taste the gastronomy of the city with a marvellous view on the sea. 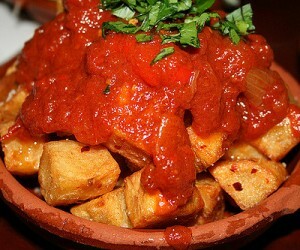 Some of the restaurants you find there are famous and highly valued in Málaga. But be aware, the prices at Muello Uno can be a little bit higher. If you like to visit some more alternative places you should definitely go to ‘La Casa Invisible’, a social and cultural organization located in the centre of Málaga, Calle Andrés Pérez nº8. It is an old house that was abandonned and afterwards occupied by young malagueños. They started creating events, concerts, exhibitions and conferences. La Casa Invisible has a spectacular courtyard where you can have a drink while you enjoy the sun and the magical atmosphere. It is also possible to eat here and they even have vegan food. 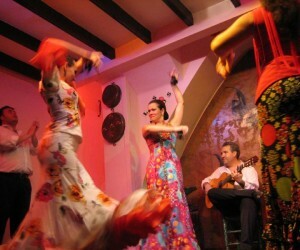 It is almost impossible to visit Málaga without seeing some Flamenco. 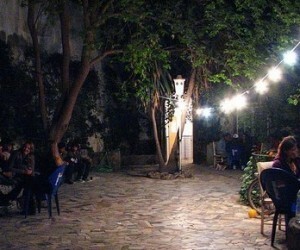 If you want to enjoy the Flamenco dance, music and songs, you should definitly visit this tavern. What makes this tavern also special is that it is not a really touristic spot, which gives you the possibility to recognize the Andalucian atmosphere together with many other malagueños sharing the same appreciation for the Flamenco. ‘Los Baños del Carmen’ is situated in the eastern part of the city very close to an old village called ‘Pedregalejo’. It is a former spa restored as a restaurant and bar where you can have a lunch, dinner or just a coffee while enjoying the peace, the sea and the atmosphere. You can still see that it is very old and there is some ruin along the way, but when you look through this you can see the bright Andalucian light colouring the Mediterrian Sea silver and gold. 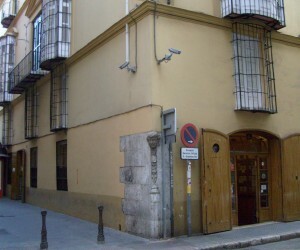 ‘La Casa de la Guardia’ is one of the most traditional tavern and wine house in Málaga, founded in 1840. In this wine house you can taste a wine typical for Málaga: “Moscatel”. This wine is made from the special Muscat grapes, which are a lot sweeter than a normal grape. You can definitely see the 150 years of history when entering this tavern. 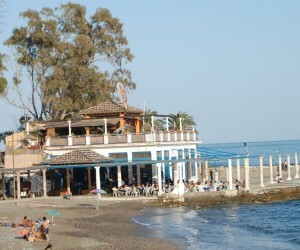 This café is located at Plaza de la Constitución, which is very famous in Málaga. Here it will be necessary to order coffee like the malagueños and that is definitely not just “a coffee for me please”. 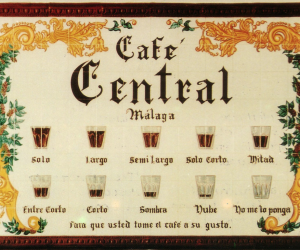 The malagueños are very proud of their way of ordering a coffee and this can only be understood in Málaga. If you ask for “un mitá” in any other place in Spain, nobody will understand you.. When you arrive at the top of the mountain Gibralfaro, you will understand why people value this unique place. At the top you will find the Gibralfaro Castle where you can have some food. But besides that, you will encounter a magical view over the city and the sea. It is the perfect place to walk to and relax after a day full of sightseeing. 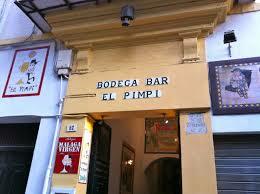 Bodega bar ‘El Pimpi’ is one of the most famous vineyard and restaurant in Málaga. The bar is located at Calle Granada, which is very central. Here you can order a wine typical for Málaga and the prices are not too high. The malagueños love to visit this place with some friends and have some drinks, especially during the weekend. And you know what is nice? Maybe you meet famous people while sitting there… Many famous people had a drink at bodega bar El Pimpi and signed a barrel of wine afterwards. Inside the bar you can also see the pictures of the famous people. Have you always wanted to try our ‘churros with chocolate’? Well if you do, you should do it here at Casa Aranda. 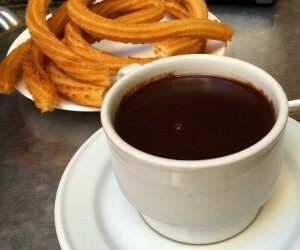 This café is known for its churros with chocolate for already 75 years. Casa Aranda is located at King Street Heredia 3 and besides the perfect place for churros with chocolate also an excellent place to have breakfast. A stop here is definitely necessary! Have a drink on the roof of this hostel, located next to the cinema Albeniz. 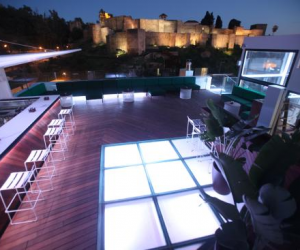 You will be amazed by the view on the Alcazaba. It is the perfect location for a romantic night out.